The LM3886 is one of National Semiconductor’s single-chip monolithic amplifier integrated circuits. It’s almost an entire amplifier-on-a-chip, with only a few extra parts required to build a fully functional, high-performance amplifier. The LM3886 features low distortion (less than 0.1%) and respectable power output. 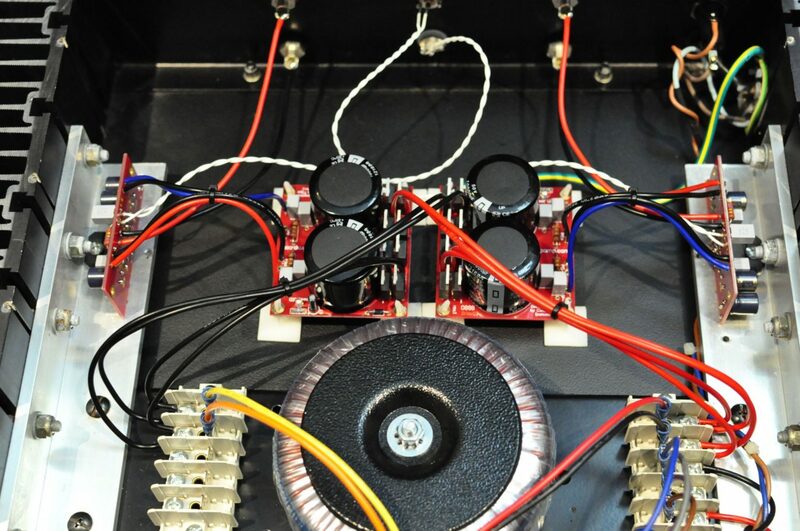 Each mono chip will output around 50 watts RMS, into 8 ohms, with correct heatsinking. It delivers a little less power into 4 ohms, though this depends on the voltage you feed the chip. The gainclone concept goes all the way back to 1999 and a company called 47 Labs. 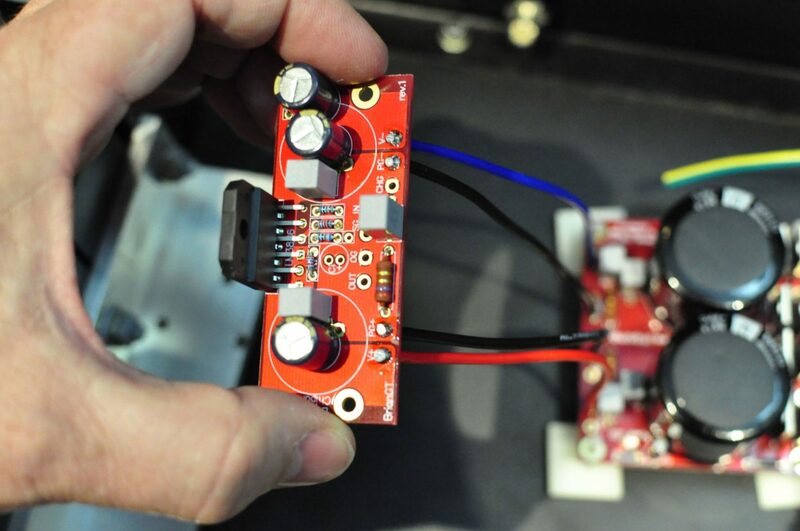 The designers at 47 Labs introduced an amplifier called the 4706 Gaincard. The Gaincard was well-reviewed at the time, but caused considerable controversy. It sounded great, despite not using much power supply filtering and hardly any parts. The very elegant and simple 4706 Gaincard amplifier, by Sakura Systems. The audio community discovered that the Gaincard amplifier, retailing for over 3K, was nothing more than an a couple of LM3886 integrated circuits and a few bucks worth of extra parts. Sure, this was creative, ingenious even – the total signal path was only a few centimeters long. The chassis was beautiful, but owners felt duped, they paid thousands of dollars for a very nice chassis, and some very cheap parts. The shot that caused all the fuss – well one of them. 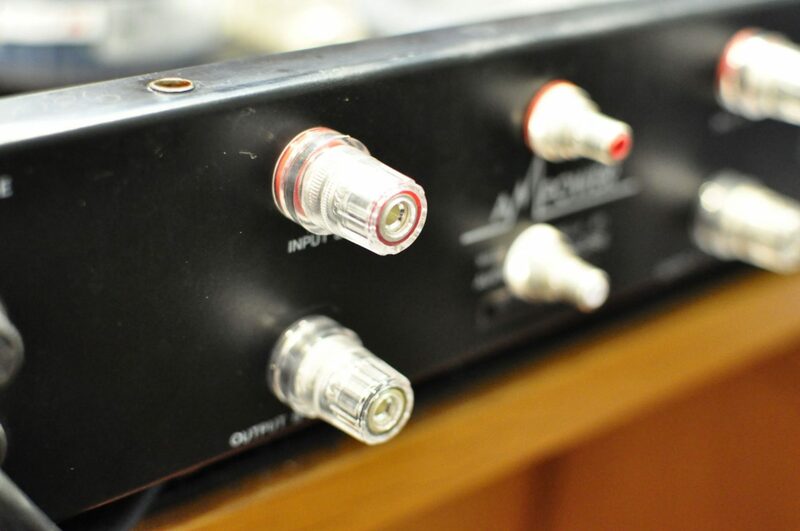 You’ll see that there really only are a couple of attenuators, and two tiny boards with half a dozen parts on each. Total cost of parts? Not much. 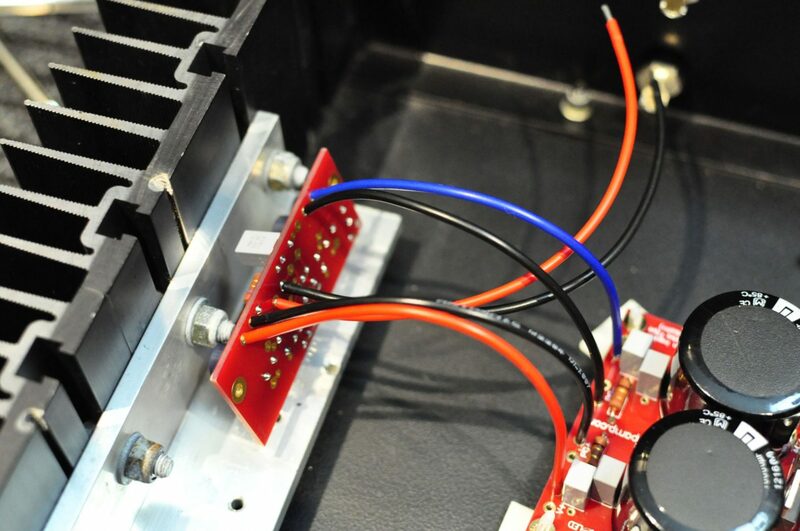 The real cost is in the chassis and separate ‘Humpty’ power supply. 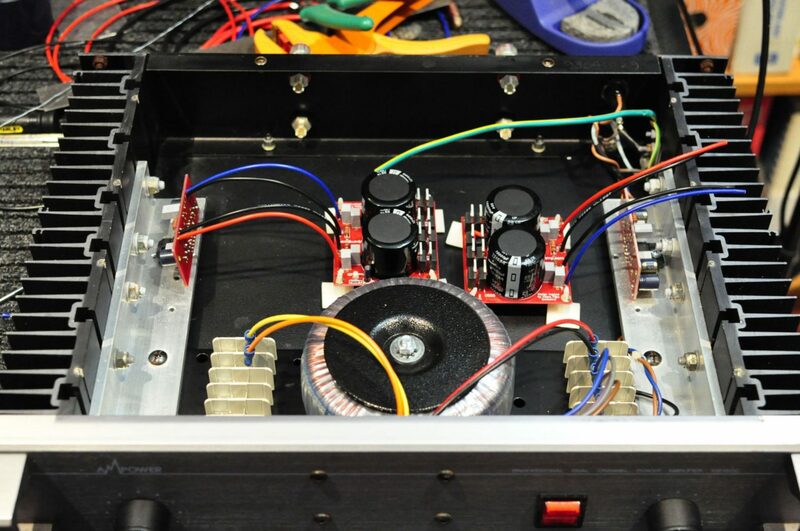 The DIY audio community became interested at this point because people realised that they could create clones, with perhaps even better sound than this expensive and well-reviewed amplifier. 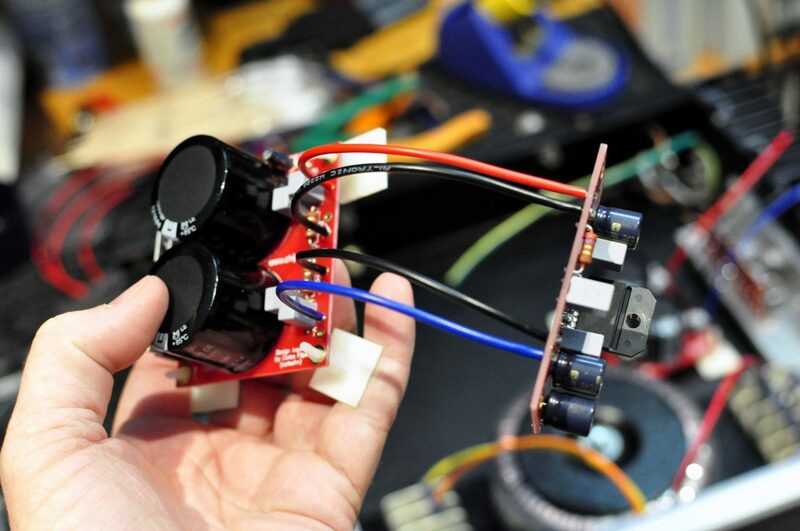 And so was born one of the great DIY audio phenomena of recent years – the gainclone! There are several gainclone kits available online and via eBay, but I like this particular set of boards and parts from chipamp.com. The PCB and parts quality are superb and, after extensive research, I found that this is the best value of all the kits out there. Everything was very easy to assemble and the Chip Amp kits include quality 10,000uF Panasonic filter capacitors, great quality resistors and other passives. The traces are gold-plated and boards are of quality fiberglass construction. 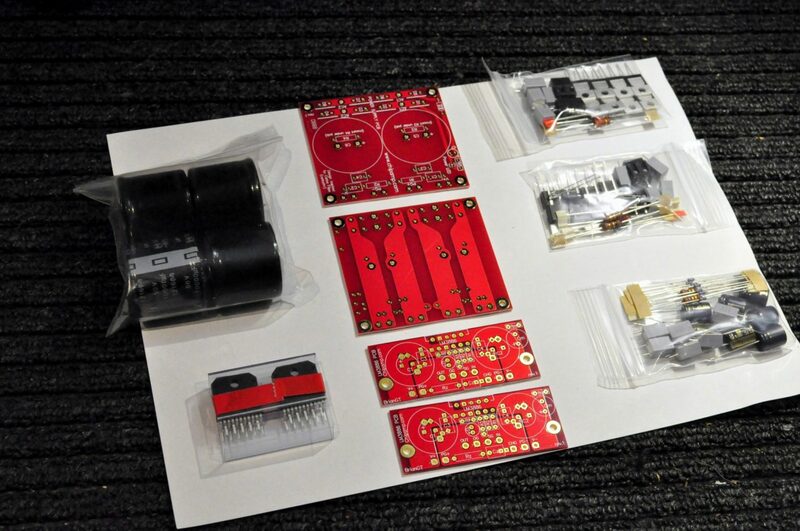 Here’s what you get in the kit – note the excellent board quality, great parts and packaging. There really is no need to buy a cheap Chinese kit when you can have all this for 100 bucks and from a nice guy like Brian! I was going to use two spare 100VA transformers with dual 12V secondaries, wired in series. The problem was that the 12V secondaries of these 100VA transformers wouldn’t be ideal in this application, yielding around 17V DC, before diode losses. Instead, I decided to use a single 300VA transformer, with dual 25V secondaries. 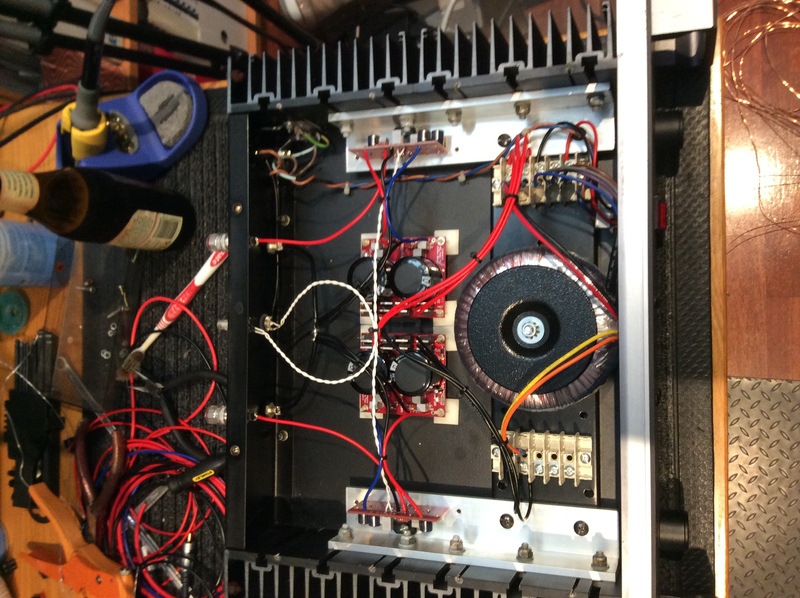 The amp is still configured with a dual mono layout, the secondary voltage is now correct for driving an 8 ohm load and the single toroidal transformer mounts nicely where the old one did in this chassis. The 25V secondaries rectify up to around 35V (25 x 1.414), minus diode losses. 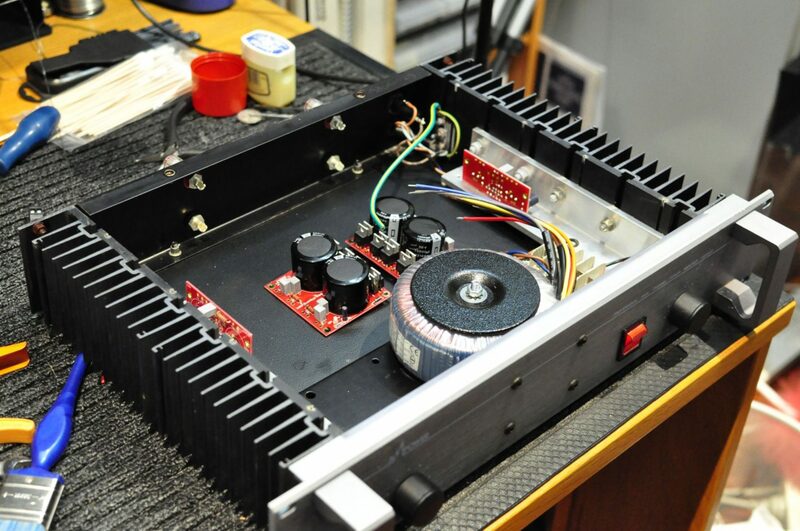 An old power amp chassis – unfortunately the 300VA mains transformer has the wrong secondary voltage, so I have ordered another 300VA with 25V secondaries. The next few pictures document my preparation of the chassis, including fitting CMC silver speaker binding posts, CMC silver RCA jacks and getting the heatsink mounting set-up. This chassis is almost perfect. I used the existing heat-sinks and right-angle brackets, the transformer mounting point, mains inlet and mains switch. I just added silver CMC speaker terminals. Here’s a close up of the inside end of these lovely silver plated CMC terminals. Silver is the best conductor and CMC make killer connectors. This is an early mock-up of the boards, sitting inside the chassis, to check for clearances, board arrangement, wiring lengths and so on. 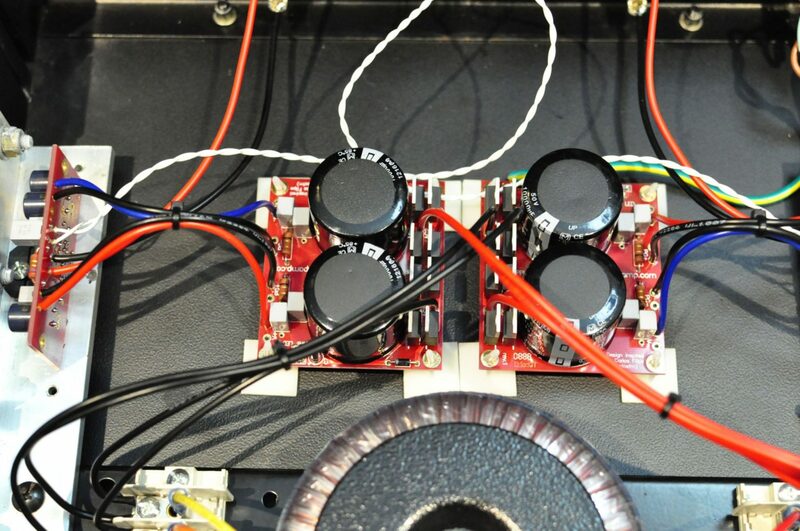 Here you can see a close-up of the finished power supply module on the left, wired up to its amplifier module. Note the thick-gauge copper wire I’ve used here. I’ve used the thickest wire I could solder to the boards, for the lowest power supply impedance. 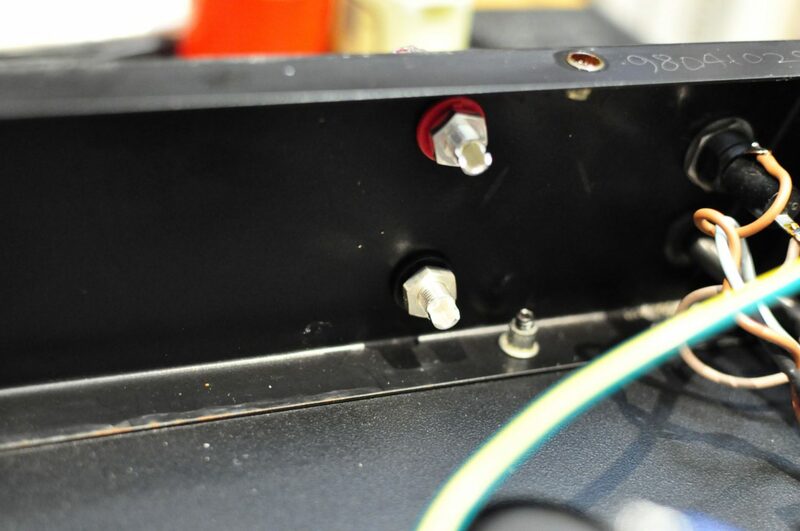 Here’s a reverse view, showing the amplifier module close-up. You’ll perhaps notice the bypassed local filter capacitors on the board, a nice way to do things. I’ve chosen these new-old stock (from my stock) terminal blocks. I like these because they are very sturdy and can take some serious wire gauge if required. I’ve used one per channel, on either side of the mains transformer. This allows me to pull the amplifier apart easily, if I ever need to. Left channel now wired in and the other still to do. I’ve used heavy-gauge stranded copper, which is quite stiff. An advantage of this wiring, apart from its low DCR, is that it adds structural rigidity to the boards, when soldered into place. You can see here that I am using PCB standoffs that have a sticky bottom, making for easy board mounting. Time to add the CMC silver RCA connectors. These are superb quality, better than the Neutrik connectors I’ve used previously. Everything wired up here and ready for a test. I have added cable ties and twisted two stands of solid-core silver-plated copper wire to carry the input signals. 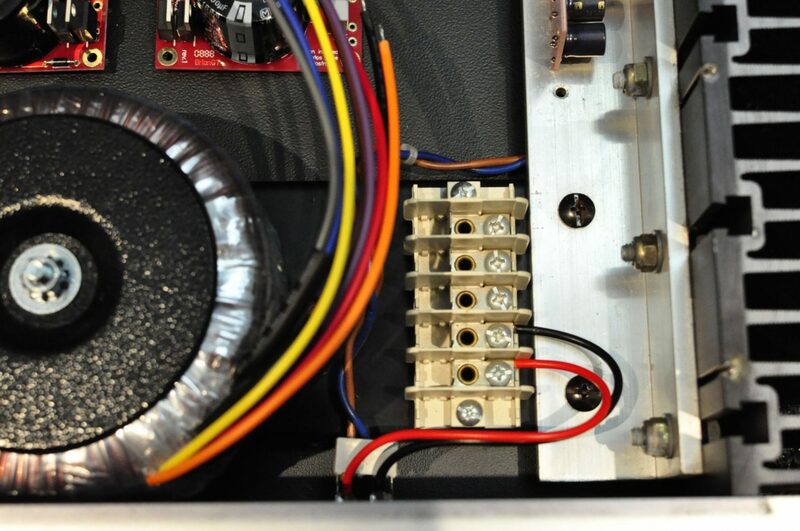 This is a close-up of some of the wiring detail in this version 1 of my LM3886 amplifier. 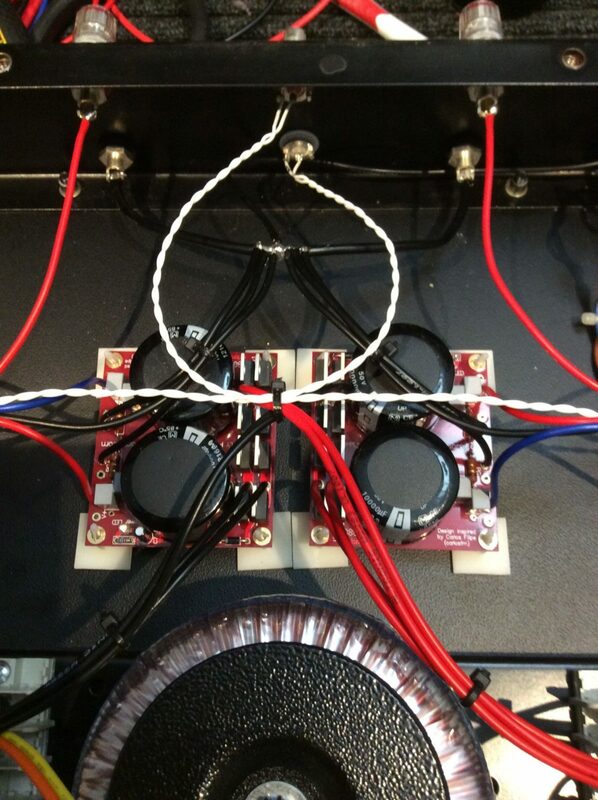 I later modified the wiring to include a true star-ground in version 2. This was in response to some hum issues. You can see from the above image that my LM3886 gainclone amplifier is up and running and she sounds great! This amplifier has air, tone and sounds smooth and relaxed. Perhaps the amplifier is a little bass-shy, compared to my Krell KSA-150, but realistically, in most installations, the LM3886 gainclone is a cracking amp. One small issue came about through not thinking carefully enough about the wiring layout. I experienced some hum on initial testing, which surprised me. After thinking and reading, I decided to modify the ground wiring layout, as shown in the images below. I rewired the ground wiring to include a true star ground. This would avoid the multiple earth returns of my initial layout, which caused the hum. 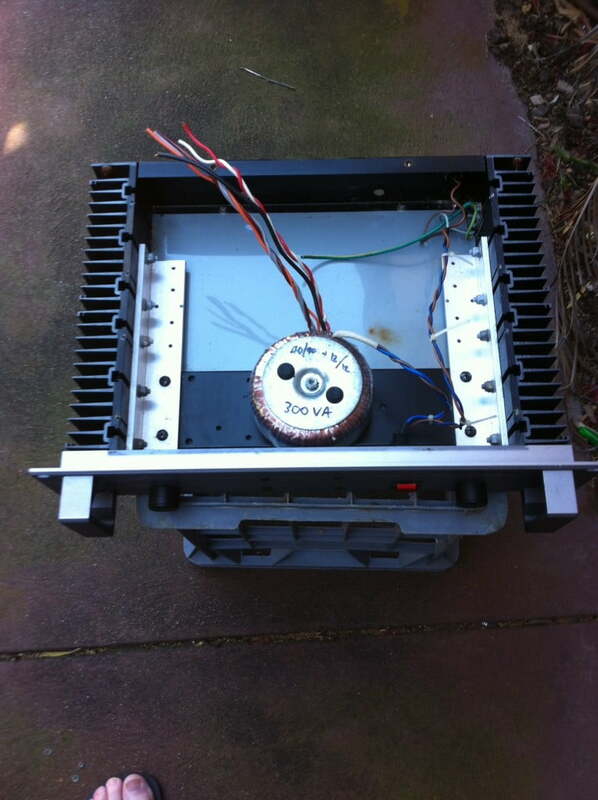 Look at the image below, to the rear of the chassis near the inputs. I’ve added a thick buss bar, linking loudspeaker grounds, amplifier and power supply grounds. The new ground buss is connected to chassis-ground, where the line cord earth wire terminates. This arrangement is totally silent, no ground loops now. 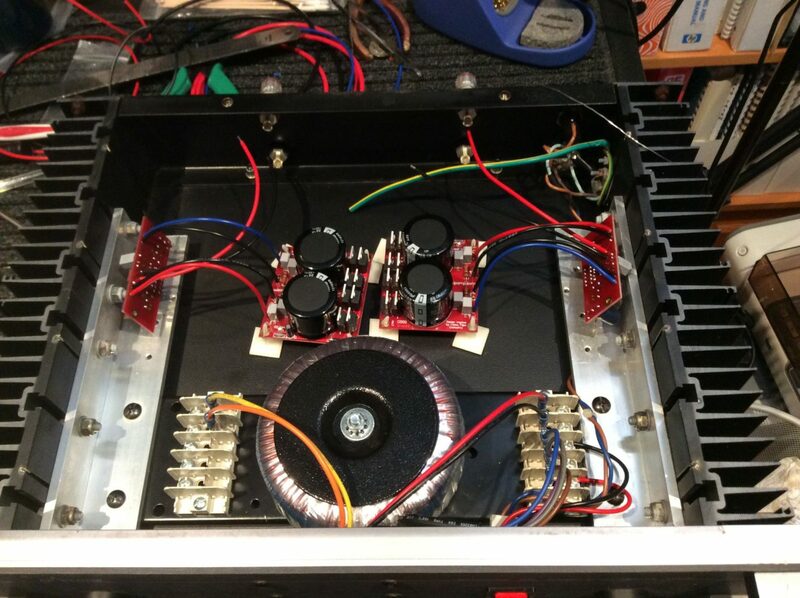 This is my revision to the amplifier and chassis wiring, after deciding on the need for a better grounding arrangement. I have completely refreshed the chassis earth at the right rear of the chassis, near the mains inlet. 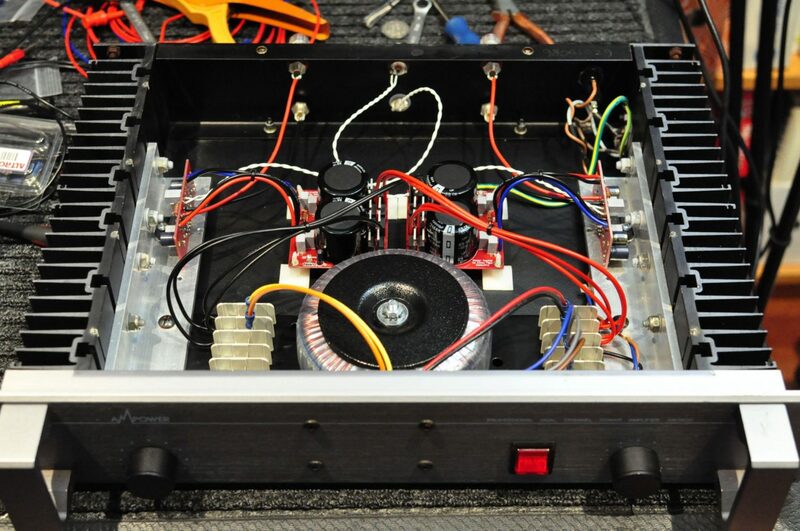 I also added a heavy-duty buss bar and routed power supply returns and amplifier earths to this point. From there they run to chassis earth. This is proper star-grounding and completely eliminated the hum I experienced previously. Note the heavy buss-bar to the rear of the chassis. All power supply returns and speaker grounds tie in to this point. Amplifier grounds also run back to this point. As a result, we have no ground loops now and the star-earth, referenced to chassis ground, at the mains inlet. Thanks Sal, yes all power grounds need to run to the star ground point, rather than to the boards and then to the ground. All ground returns and speaker grounds connect to this central point that represents the lowest impedance node of the circuit. The signal grounds are connected to the amp boards as normal, they are referenced to the star ground and not carrying large return currents in this configuration. This is ideal as signal ground and power grounds are kept somewhat separate. They are not actually separate of course, but “staggered” if you want to think of it that way. Look carefully at the last picture – click on it to get the enlargement and you will see my star earth is connected by a wire to the chassis earth – it exits out the back of the start ground and heads to the right rear of the chassis where the mains earth is connected. I completed the changes on both amps, dead quite and clearer. I have to thank you I really appreciate you posting this info. And it might be helpful if the folks at ChipAmp put these suggestions in their information. It really made a huge difference. 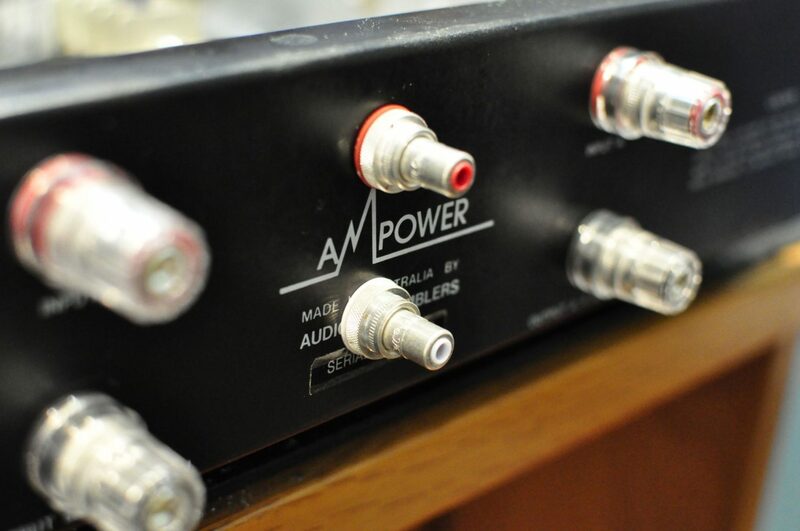 Hi Sal, very pleased to hear that the changes made such a difference to your amp and I’m glad I was able to assist! This is one sweet amp. I love the Hakko as well. Thanks Allan, yes I am still using the amp and I’m very happy with it. I have another that I am going to build sometime soon, this time based on the LM4780. Excellent build! Star config ground is the only way to go, I had the same problem. Always like a recycled case too. I also added an “input sensitivity” (volume) 2 gang potentiometer to the lines in, recycled from a 70s Sansui amp. This thing is dead silent, been running almost daily for 14 years now, no problems. I made my own preamp, which is also absolutely silent, running it all into some 70s FANE monitors, it’s a match made in heaven. Hi Ben, thanks for your comments. Star grounding really is the only technically sound way to go with any audio gear and your tip about rotating transformers for the lowest radiated hum is a good one. These are very quiet amps when set up correctly, I’ve been using mine as a power amp and have kept the signal path as clean as possible but either way, LM3886 amps are capable of great sound. My buddy is now borrowing mine while I restore his Krell KSA-200S! Regards, Mike. Anyone know what happened to chipamp.com, which appears to be a dead URL, or whether the kits are sold elsewhere?